The two sides formally agreed to make it an integrated part of the regular full-fledged annual session to review the progress in the implementation of the decisions taken at the India-Russia summits. Indian External Affairs Minister Salman Khurshid and Russian Deputy Prime Minister Dmitry Rogozin agreed on Monday to reinvigorate the Indo-Russian Inter-Governmental Commission on Trade, Economic, Scientific, Technological and Cultural Cooperation (IRIGC) by holding a regular intersession meeting in between the two annual full-fledged sessions of the IRIGC. Khurshid had arrived in Moscow on his four-day visit on Saturday from Alamaty following attending the Istanbul process conference on Afghanistan to co-chair the second intersession meeting of the IRIGC. In July 2012, Rogozin, a close ally of President Vladimir Putin, travelled to New Delhi after his appointment to hold the IRIGC’s random first intersession meeting on the invitation of the-then Indian counterpart S.M Krishna. But now the two sides have formally agreed to make it an integrated part of the regular full-fledged annual session to review the progress in the implementation of the decisions taken at the India-Russia summits by the leaderships of the two countries. The idea to hold the IRIGC’s intersession meeting was proposed by Rogozin which Khurshid promptly accepted as a key step to monitor the trade and economic ties between India and Russia. This was Khurshid’s first visit to Russia since he was appointed External Affairs Minister last October. “Russians themselves wanted the External Affairs Minister as a senior member of the Cabinet, to pay a visit to Moscow, to have a wide-ranging interaction with him on the entire spectrum of the Indo-Russian bilateral relations,” a source told this writer on the condition of anonymity. “I propose that we meet at least once in between regular sessions to discuss the full gamut of our cooperation in trade, industry, defence, science and technology,” Rogozin said, welcoming Khurshid at the talks in a restricted format at the President Hotel. He also proposed to expand the locations of the meetings beyond Moscow and New Delhi-the capitals of the two countries. “We are two great beautiful countries, with an endless diversity of regions. I am very interested to travel to different cities in India, and I will be happy to take you to our next meeting to the Far East, the Urals, Siberia and Sochi, where we will be hosting the 2014 Winter Olympics,” he said. “Now we just need to talk about how far we have come and how much more we need to do, to prepare for the next summit, in Moscow,” he added. The sides agreed to set up a Joint Study Group (JSG) in order to speed up the signing of the Comprehensive Economic Cooperation Agreement (CECA) with the three-nation Customs Union of Russia, Belarus and Kazakhstan, which have formed a Eurasian Economic Space. Explaining the necessity of a JSG on CECA, Commerce Secretary Ravi Kapur told the Russian side at the meeting that India fully endorses the view that CECA will have the parts of trade, covering services, investments, intellectual property and the whole gamut of the comprehensive agreement. “So we are completely on board. We share your concern that before we embark on journey for the CECA, we must study profits and losses, the benefits and disadvantages of such an agreement,” Kapur said. “This is precisely for which the JSG is supposed to be created, because this study group will actually sit down and analyze the benefits and advantages of such an agreement. Only after a favourable decision is taken by JSG shall we move towards first steps of setting up CECA. So it is imperative that as we have agreed we should have a quick decision on the JSG,” he said. “We are awaiting a decision by Eurasian Economic Commission for the establishment of JSG,” Kapur added. On meeting the trade target of $20 billion by 2015, Kapur said that as an impact of Russia joining the WTO, India hopes that the current trade figure of about $12 billion will immediately move up to more than $20 billion in a couple of years. At the intersession’s restricted format talks, India and Russia also decided to further step up energy cooperation in civil nuclear and hydrocarbon sectors. India’s domestic energy needs are rising fast and it has renewed its focus on nuclear energy, a field in which Russia can expand its cooperation with India. Demand for nuclear energy is expected to grow nearly four times in India from 2015 to 2035. Khurshid conveyed to the Russian side that the first unit of the Kudankulam power plant in Tamil Nadu, is at sub-critical stage and was expected to be commissioned “any day,” in May and that the second unit which was 93 percent complete is also likely to be commissioned later this year. The sides also discussed to conclude expeditiously the negotiations on the techno-commercial offer for the construction of Units 3 and 4 of the Kudankulam nuclear power plant. Recently the Cabinet Committee on Security (CCS) cleared the administrative and financial sanction for building Units 3 and 4 by giving go-ahead to the Russian offer of about $6.4 billion.The Protocol for state credits for the construction of Kudankulam Units 3 and 4 was signed in July 2012. Russia agreed to extend export credit amounting to $3.4 billion. However, Russia wanted to renegotiate the techno-commercial offer after India made it clear that new civil nuclear liability law will apply to these reactors. It conveyed to India that the offer was too less in view of the liability costs. There was confusion on this after the CCS sanction too, as India was under the impression that it was approving a Russian quote that came well after New Delhi’s stand on the liability law had been conveyed. But after the clearance by the CCS of the administrative and financial sanction, Russia claimed that it had not factored in the liability cost as India had not formally informed about it, according to media reports. India has repeatedly made it clear that making an exception for Russia will amount to diluting its civil nuclear liability law which will encourage the US and France to seek similar exceptions, which it cannot afford. “Kudankulam 1 and 2 have been placed in a certain framework based on timeline during which we have moved forward and will that remain the same for 3 and 4 or you have to organize it in a different format,” Khurshid told Moscow-based Indian journalists, at a reception hosted by the Indian ambassador Ajai Malhotra in the honour of Khurshid. “But I do not think in those discussions there is anything there which can be an impediment but there are certain things that you need to converge on so that finally you come to a mutually accepted format. Those are the discussions taking place,” he added. During the meeting, the sides also discussed the prospects of bilateral cooperation in oil and gas, for which it is essential to source oil and gas from Russia and leverage the market and downstream business in India with involvement of respective oil and gas companies of both the countries. The IRIGC intersession meeting also discussed the prospects of setting up a titanium joint venture (JV) with Russian company Tekhnokhim in Odisha which is a completely new project with a special economic zone (SEZ). The previous titanium joint venture to be set up under the 2008 agreement fell apart due to a land ownership dispute between the two sides and the matter is under arbitration. The Indian side conveyed to the Russians to ask the company make a formal proposal for the SEZ. Under the new project, the Tekhnokhim has proposed to set up a special economic zone in Odisha for producing titanium. The External Affairs Ministry has forwarded the proposal to the Department of Industrial Policy and Promotion (DIPP). The Odisha state government has also shown keen interest in the project and it has promised to make land available for it as desired by the Russian company. 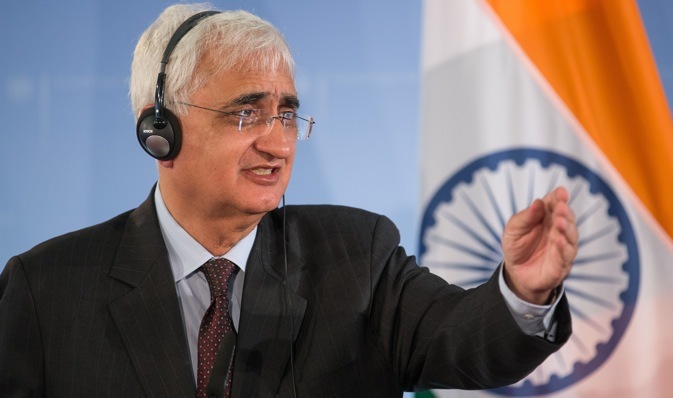 Khurshid was forced to cut short his four-day visit and return to New Delhi because the Parliament was to take up the Finance Bill on Tuesday. He also could not hold face-to-face talks with his Russian counterpart Sergei Lavrov, earlier planned for Tuesday, although he had a telephonic conversation with him, which included urgent bilateral, regional and international issues. Following the plenary meeting on Monday, he straightway left for the Moscow airport. Dadan Upadhyay is an Indian journalist based in Moscow.